What we have left to talk about is how to override existing theme functions and files so we're not dealing with the variables but we're dealing with the markup that's generated through the "theme" function or file. Let's start by looking at how to override theme functions. Go ahead and jump to your module folder and in the steps folder, go ahead and open up the ninth step, which is called "overriding-functions". Go ahead and copy the entire code and paste it over the code in your "lookandfeel dot module" file. Save it. Ok.
Now what we've added to this version are two things. One is a function that's an implementation of "hook_theme_registry_alter". 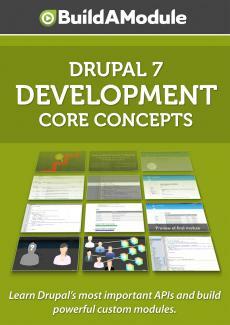 You can learn more about this function on this page on "api dot drupal dot org". So the structure of this hook is pretty simple. It just takes one parameter which is the "theme_registry" and this is the entire theme registry that gets built when we build the theme registry when the cache gets cleared. So this is an array that contains all of the theme functions and all of the template files listed, as well as some additional parameters. And it's passed as a reference with this ampersand and so any changes made to this variable are made to the parent function as well. In it, what we're doing is changing an item so that we're registering a alternate theme function. Instead of using "item_list", the default that's set by core, we're using our own function. I'm going to go ahead and set a breakpoint right here and we're going to run through this script and stop here so we can take a look at what the theme registry actually look like. So I'm going to go back to our browser, and I'm going to start a debugging session in the browser and I'm going to flush all caches. I'm going to go ahead and jump back to the editor and here we have this script stopped right in the middle of our "theme_registry_alter" function. Ok. Now we can expand our "theme_registry" variable here and take a look at it's structure. If we scroll down, we see that there are a ton of theme functions and template files here. Let's go ahead and find our "item_list" theme function. Now you might have to scroll down quite a bit to get there. Here it is, right here. I'm going to go ahead and expand this. So we have a few items set here. We have the "variables" that get passed to it. The "type". This is registered in a module. And the "theme_path", which is where the original "theme" function is registered into.